I was horrified but unfortunately not surprised to hear the news of another tragic death of a factory worker in China. The 19 year old from Shenzhen is the 9th suspected suicide at Foxconn, a Taiwanese firm making computers and phones for companies like Apple and Sony. In 2003 I was invited to China with two other British photographers, Sion Touhig and Mike Goldwater to document one of China’s New Economic Development Zones. Journalists were taken around the Provinces of South East China to witness the rapid industrialisation in the region as millions of workers were sucked into factories from small villages in the countryside. Shenzhen, has grown from a small village into a city with a population over 10 million within 20 years. Many factories we visited had no infrastructure at all, roads were still being built. They were the showcases, brand new, clean and bright, but even so it was clear working conditions were appalling. 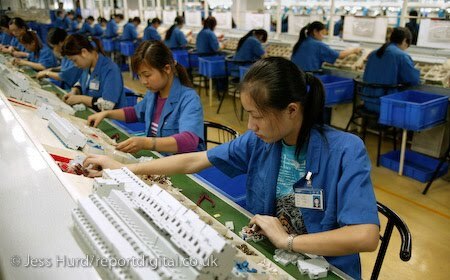 The image pictured shows Chinese women workers at the Chint Group a private firm and China’s largest high voltage electrical appliance maker based in Wenzhou, Zhejiang Province. We were told the company only use women on this part of the production line because their hands were ‘smaller and faster’. The work is long, repetitive, tedious and painful. Every element of the workers lives were regulated by the company from segregated dormitories to what seemed to be regulation length hair. Wherever we visited our questions about unions were batted away by company management, why would such happy workers need trade unions? The recent increase in suicides and workers attempts to escape the monotony of virtually prison worker life is no surprise to me and I doubt the introduction of pledges for workers to sign stating that they will not kill themselves, will change the situation. The global market race for cheaper products is made with the blood of these workers.